“We have had some major family health issues and ED was taking over me. I’ve had 5 good days in a row and hope to have a whole week. My therapist is recommending I accept the relapses and stop trying for 100% relapse free recovery. Kind of a long text, but it got me thinking. Life and lasting eating disorder recovery is kind of like training for a marathon. I sat on that idea for a bit, went for my weekend trail run training and had this huge download of juicy ideas come while running. I half thought about stopping and shooting a darn video right there in the middle of the trail! Alas, I trusted it would all come back when I got home and in front of a computer. and lastly…never, ever, ever, ever give up. Ever. The only people who fail are those who give up. If you’re still committed to being bulimia free, then you are in recovery and your outcome is you being a non-bulimic. It will happen. If you’ve committed to your recovery, then get into action now! Here’s my Getting Started Page. Use it! Contact me if you want to be a part of our weekly bulimia support calls (every Tuesday at 5:30pm PT/8:30pm ET). Email me now and I will send you the dial in number. The calls are FREE – all you need do is ask me for the conference call number and I’ll send it to you. How easy is that?! Lastly, if you want to go further faster you hire a coach like me. 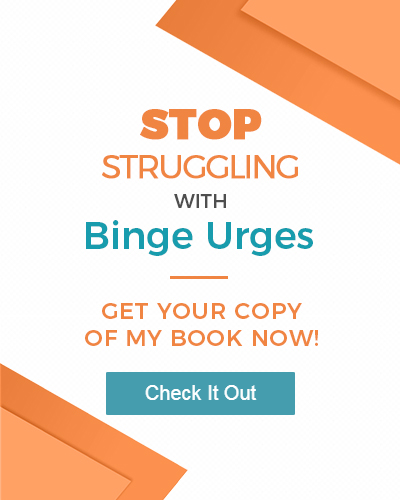 If you’ve been trying everything and can’t get lasting recovery to stick or just keep on the spiral out of control with your obsessive thoughts (even if you have a therapist), you can still hire an eating disorder recovery coach to get you results. Therapists help you with your past. Coaches help you get where you want to go. I’d like to be your coach if you’re committed to your outcome – lasting recovery. If you’re not, let’s not waste each others’ time. Coaching isn’t for everyone – it’s for those who want their outcome NOW. My goal is to have you bulimia fee in 90 days or less. Danielle’s Bulimia Recovery Story Update! previous post: Share Your Eating Disorder Secret – It Helps!